Shoppers in a Bangkok supermarket. Exports were down but growth of domestic demand took up the slack and powered the economy to faster performance in the fourth quarter of 2018 than the third. The economy grew at the fastest pace in six years in 2018, with the fourth-quarter performance beating expectations on higher domestic demand and growing tourism arrivals. The state planning agency, the National Economic and Social Development Council (NESDC), reported Monday that GDP rose 3.7% in the last quarter of 2018, up from a revised 3.2% in the third quarter. After seasonal adjustment, the economy grew by 0.8% quarter-on-quarter from the third quarter. Thosaporn Sirisamphand, the NESDC`s secretary-general, said the expansion in the fourth quarter was supported by private consumption and private investment, gains in the export of goods and services, the acceleration of wholesale and retail trade, hotels and restaurants and the transport and communication sectors. However, government consumption softened while the agriculture and construction sectors slowed down, he said. The economy expanded 4.1% for the full year, compared with a revised 4% for 2017, the quickest expansion in six years. Export value grew by 7.7%, while private consumption and total investment grew by 4.6% and 3.8%, respectively. Headline inflation averaged 1.1% and the current account recorded a surplus of 7.4% of GDP. "The economy has grown steadily the past five years," said Mr Thosaporn. Thailand`s economic growth was 1% in 2014, 3% in 2015, 3.3% in 2016 and 4% in 2017. The NESDC previously predicted on Nov 19 growth of 4.2% for 2018, but state investment contracted by 0.1% and the pace of foreign arrivals slowed in the fourth quarter, he said. In 2019, the economy is projected to grow in a range of 3.5-4.5%. Mr Thosaporn said growth will be supported by favourable momentum in private consumption; an improvement in private investment attributed to rising capacity utilisation and increased Board of Investment applications for investment; acceleration of public investment following progress in key public infrastructure projects; a robust tourism sector as arrivals and receipts keep growing; and a clearer redirection of global trade, production, and investment to ease the impacts from the global slowdown. The agency lowered its 2019 export growth outlook to 4.1% from 4.6% forecast in November. Private consumption and total investment are expected to grow by 4.2% and 5.1%, respectively. Headline inflation is forecast in the range of 0.5-1.5% and the current account will record a surplus of 6.2% of GDP. "Higher economic growth is expected if the government can accelerate state agencies to disburse investment spending as targeted, export volumes to emerging markets are higher and tourist arrivals grow," he said. 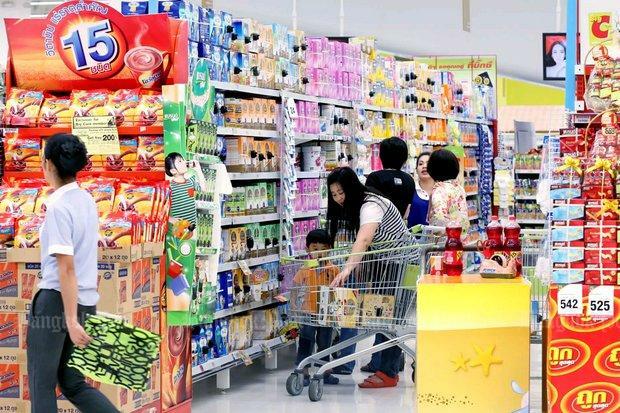 Tim Leelahaphan, an economist at Standard Chartered Bank Thai, said the bank remains optimistic on its outlook, forecasting GDP growth of 4.5% in 2019. "While we acknowledge recent political noise, we expect it to have a limited adverse effect on the economy. That said, political stability is crucial to sustaining growth momentum, as domestic drivers -- consumption and investment -- are the key sources of growth amid global uncertainty," he said.